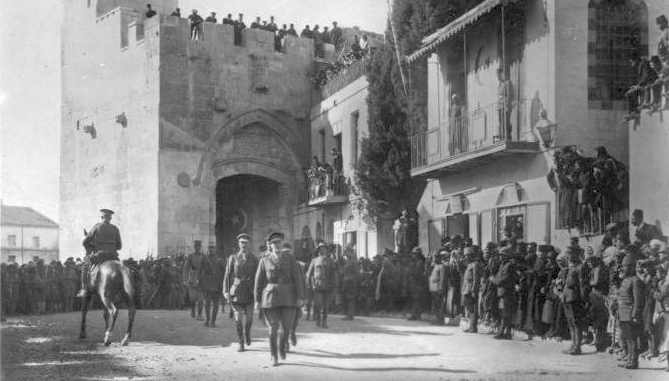 British General Edmund Allenby entered Jerusalem exactly a century ago today, on December 11th 1917, after his forces conquered the town two days earlier. Before going through the Jaffa Gate he dismounted from his horse and entered on foot, as a sign of respect for the ancient city he was taking control of. If city is the right word. All of Jerusalem could have fitted into one of London's larger parks in those days. This is brought home when you take a look at the military maps which Allenby and his troops used as they conquered the area they called Palestine from the Ottomans (who didn't call it that) from the Negev in the south moving ever further northwards. If you haven't seen those maps, here they are. (Technical note: the best way to see the maps is by starting from that link, then choosing the specific area you're interested in from the list in the lower left corner of the screen. Once you've chosen a map, the way to see it in high-quality is to use the "full screen" button, the one with the two little arrows, in the upper right corner. Note that when you zoom in and out the thumbnail map in the lower left corner shows what part of the map you're seeing). Take the map of Jerusalem (obviously), and you'll see why Allenby enteerd the town at Jaffa gate and not, say, at the Calavatra bridge near the present day entrance to the city, some miles to the west: Because the site of the future Calavatra bridge was an empty field far to the west of town. According to the map, Jerusalem was the walled Old City, and that's almost it. Should we visit Tel Aviv? The name of the British map is Jaffa, and about the only part of modern Tel Aviv you'll find is Sarona, and miles to the north the tiny Arab village of Sheikh Muannis, where Tel Aviv University is today. Also, the map helpfully notes the sand dunes at the center of today's Tel Aviv. But wait. That's actually a bit odd. Tel Aviv was founded in 1909; at least a small version of it ought to have been on the British military maps printed in May 1917? Well, I recommend looking at the bottom right corner of the map, where it says that it's a reprint made in May 1917, from... The Palestine Exploration Fund maps, surveyed in 1878! This makes these maps even more interesting, because they tell us two very interesting things. The first is that when the British military map-makers needed to prepare maps with which to conquer Palestine, the most recent ones they had at hand were 39 years old, but they weren't troubled because they knew that not much had changed between 1787 and 1917. Moreover, they were able to use the maps because their assumption about the limited change was basically correct. Here and there some changes had been made on the ground, such as the founding of the Jaffa suburb of Tel Aviv; but these changes weren't significant enough to bother the military planners. The second thing is that this series of maps, put online just last week at the website of the Israel State Archives, shows what the country looked like immediately before the beginning of Zionism. The earliest prot-Zionist attempt at settlement, in Petach Tikva, was in 1878; the first successful wave of modern Jewish settlements began in 1882. (The Zionist movement was founded as a movement in 1897). Was it an empty land? Of course not. Quite sparsely populated, however. And the Jews aren't visible on the map at all. Even in Jerusalem, where there was already a Jewsih majority in 1878, the names on the map are Arabic. The British archeologist surveyors in the 1870s didn't see the Jews at all, or if they saw them they didn't notice. Which is the opposite of what we're told these days, abut how the colonial Brits did't see any Arabs, and neither did the Jews. I think it's a valuable set of maps. Go yee and navigate. What does Trump's recognition of Jerusalem tell Israelis about their place in the world? President Trump's recognition of Jerusalem as Israel's capital has done more than upend 70 years of American policy. It has underlined how far the Jews still are from international acceptance on their own terms, rather than as others would have them. It indicates that this lack of acceptance is still fundamental to how the world relates to the Jews. There has been a raging argument between archeologists these past 30 years about how much historical truth there is in the Biblical stories. A consensus has slowly emerged that King David was a historical figure and that he lived in Jerusalem 3,000 years ago; the argument still rages around the question if his Jerusalem was a small and insignificant village or perhaps something much grander. Some historians insist the Jews emerged as a real nation with their own culture only once their elite had been exiled to Babylon, where they collected, collated and edited the Biblical stories for the first time: those would be the people who claimed "By the rivers of Babylon/there we sat down/there we wept/as we remembered Zion" – Zion being one of the names of Jerusalem. There is no way to make sense of the New Testament unless one accepts that Jesus was preaching and died in Jerusalem, the capital of the Jews. In the 2nd century Hadrian ploughed Jerusalem and built a Roman town in its stead precisely because he assumed that would put an end to the pesky Jews. Yet at no point in the past 2,000 years of history did any significant political power ever see the real city of Jerusalem as a Jewish capital. In one of history's remarkable twists, British forces conquered Jerusalem exactly a century ago this week. At the time a majority of Jerusalemites were Jews, and had been for at least 40 years if not 80, yet the British carefully gerrymandered all municipal elections to ensure there'd never be a Jewish mayor. During 30 years of British rule there were a number of proposals to partition the land; none of them ever suggested Jewish control over Jerusalem. The partition plan eventually adopted by the UN 70 years ago last week invented an unprecedented departure from the universal principle of sovereignty, the Corpus Separatum, to ensure the Jews – still a majority of the city's population – would not control Jerusalem. Deliberations on implementing this oddity went on at the UN years after Israel and Jordan had divided the city between them. After the Six Day War Israel's leaders assumed the Christian world, which the West could still have been considered to be, would refuse to accept Jewish control of the city. They were talking about religion and its expression in Western civilization, not about international laws. The near-universal rejection of President Trump's recognition of the plain fact that Jerusalem is Israel's capital looks far more sinister than a mere disagreement over the best way to promote a notional peace agreement. This is reinforced by the blatant flimsiness of the reasons for the rejection and their distance from reality. It looks to this Israeli as a continuation of an ancient insistence that the Jews must be what the others say, and that for them to be accepted they must behave as the others demand. It can't be that Jerusalem is the capital of the Jewish State, because that would mean that the Jews really have returned to national normality, and that they are a nation and state as all the other 200 states are. The louder the howls are, the more pervasive the condemnations, the more it seems to many regular, middle of the road Israelis that our place among the nations is still not yet finally accepted nor sincere. Postscript: the cool response of some American Jews to the recognition is also a worthy theme for analysis. Not today, however.